The new Dell Precision 5530 2-in-1 is a less powerful — but convertible — sibling of the 15.6-inch Precision 5530 mobile workstation. Its specs are similar to those of the Dell XPS 9575, but this mobile workstation features Radeon Pro WX Vega M GL graphics and is scheduled to hit the market in July/August. 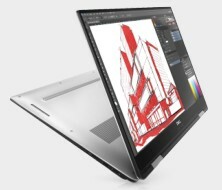 Advertised by Dell as the world's smallest 15-inch convertible workstation for professionals on the go, the new Precision 5530 2-in-1 is the same as the XPS 9575, but with Radeon Pro WX graphics added to the mix. Thanks to the ultra-thin GORE Thermal Insulation cooling, this machine can deliver the performance needed for rich content creation and editing in "an impossibly thin" design that has a 360-degree hinge which allows for multiple ways of interaction. The list of operating system choices consists of the following 4 items: Ubuntu 16.04 SP1, Red Hat 7.5, Windows 10 Home 64, and Windows 10 Pro 64. The touchscreen display of the Dell Precision 5540 2-in-1 features Active Pen support with 4,096 levels of pressure, low latency, and tilt functionality "for an experience as close to sketching on paper as possible." The new MagLev keyboard has a reduced thickness that does not have a negative impact on the critical shortcuts essential while creating content. Although the price of the Precision 5530 2-in-1 is not official yet, the price of the XPS 9575 — which starts at US$1,499.99 — should give us a better idea on what to expect. Obviously, the price can go well over the US$2,000 barrier, depending on the hardware and software options chosen.